Amana Healthcare, a specialist healthcare provider based in Al Ain, will be able to provide a telepresence robot service to patients and health professionals through a partnership with VGo Communications. 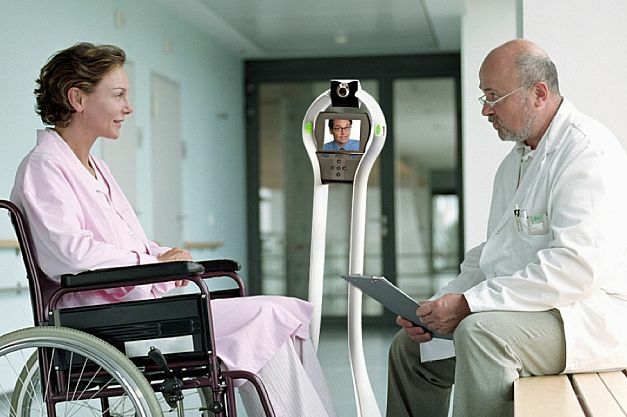 The VGo robot consists of a wheeled base with a screen and camera, which can be operated remotely by a user to replicate their presence in another location. The telepresence robots will allow patients, family members or health professionals to drive the robot and interact through the built in video and audio. A fleet of robots will kept at Amana Healthcare hospitals, which specialize in long-term acute care, post-acute rehabilitation and home transition and respite care services. The robots will allow doctors and family members to call in visit Amana facilities. Other robots will be made available to patients and their families for use at school, at home or on special occasions, to participate in social and community activities without leaving the safety of their ICU or hospital bed. Robots can be controlled using a VGo iPad App or through a PC or Mac web interface, which connects over WiFi or LTE 4G. The ‘head' of the robot includes 6 inch screen, speaker, camera, microphones and lights so that the remote user can interact with others. "We are proud to be the first healthcare provider in the Middle East to bring this cutting-edge telepresence robotics technology to the region," said Magi Livadaris, Vice President for Clinical Operations at Amana Healthcare. "Patients at Amana Healthcare can use the robots to interact with the outside world - allowing hospitalized children to attend school remotely or patients in an overseas hospital to choose their room or interact with specialists at Amana Healthcare before returning home. And families can use the same robotic solution to visit and virtually connect with their loved ones at Amana Healthcare, whether from home or abroad." "Technological innovation is central to Amana Healthcare's mission to deliver world-class care to its patients - and partnering with VGo, one of the world's top telepresence robotics firms, gives patients at Amana Healthcare the benefit of the same technology used at world-famous hospitals such as Massachusetts General Hospital, Boston Children's Hospital and the Mayo Clinic," said Ali A. Hashemi, Director at Amana Healthcare. "It also allows us to take full advantage of opportunities created by the telemedicine standard recently introduced by the Health Authority of Abu Dhabi." "We are delighted to have partnered with Amana Healthcare and AP Medical Innovations to bring VGo's world-class robotic telepresence technology to the Middle East," said Ned Semonite Vice President of Marketing and Product Development at VGo Communications. "VGo adds significant value in healthcare and other sectors including corporate communication, education, training, government applications, security, energy and manufacturing - and we look forward to working closely with our partner to bring these technologies to the Middle East." About Amana Healthcare: Amana Healthcare is a specialized provider of long-term acute care, post-acute rehabilitation and home transition and respite care services in the United Arab Emirates. Founded in 2013 with an 80-bed hospital with majlis facilities, family rooms, relaxation rooms, a sensory room and outdoor park area in the Al Shoaiba District of Al Ain, Amana Healthcare is licensed by the Health Authority of Abu Dhabi to provide medical and rehabilitation services for complex patients that require intensive rehabilitation or round-the-clock medical supervision by a highly trained team of doctors, nurses and rehabilitation experts committed to medical excellence and quality of life for each and every patient, Amana Healthcare's services include intensive medical and nursing care, medication and symptom management, mobility support, physiotherapy, occupational therapy, speech therapy, respiratory therapy, nutrition/dietetics and 24-hour on-site physician care for patients of all ages. A second facility is due to open in Abu Dhabi in late 2014. For more information about Amana Healthcare, please visit www.amanahealthcare.com. About VGo: VGo Communications, Inc. develops and markets robotic telepresence solutions for healthcare, education and the workplace. With VGo, an individual's presence is established in a distant location such that they can interact and perform their job in ways not previously possible. Now people can see, hear, be seen, be heard and move around - just as if they were there - all with a great user experience and at an affordable price. For more information go to www.vgocom.com .